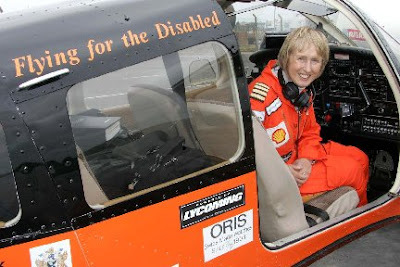 Record-breaking pilot Polly Vacher MBE stopped at Glasgow Prestwick Airport on Tuesday on the second day of her Wings Around Britain challenge. A reception was held in the airport’s Aviator Suite where Polly and Pauline Gallagher, her passenger for the Glasgow to Prestwick leg of the trip, met chief executive Mark Rodwell and members of the Prestwick branch of the Royal Aeronautical Society. Polly is attempting to land at more than 200 UK airfields in Golf November, her single engine Dakota Piper aircraft, between May 21 and July 31 to support and promote the Flying Scholarships for the Disabled scheme, which was founded in 1983. A disabled person will accompany Polly on each sector of the trip whenever possible. Yesterday’s companion Pauline, 30, is an Air Cadets Flying Officer from Greenock and suffers from cerebral palsy. Polly is also hoping the trip will raise the profile of her book Wings Around The World, the proceeds from which go to Flying Scholarships for the Disabled. 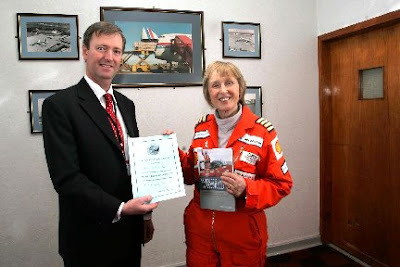 Prestwick chief executive Mark Rodwell received a certificate from Polly to recognise the airport’s part in helping the challenge by hosting the reception and waiving the landing and navigation charges for Golf November. He then purchased a copy of Wings Around The World and had it signed by Polly before she set off again. Polly, who is past retirement age and lives in Oxfordshire, learned to fly with her husband Peter in Australia in 1994. She later became the first woman to fly solo over the North Pole in a single engine aircraft, the first woman to fly solo in the Antarctica in a single engine aircraft and the first woman to fly solo around the world landing on all seven continents. After leaving Birmingham Airport on Monday, Polly flew north to the Isle of Man and then Glasgow. The short flight to Prestwick was made early on Tuesday afternoon. Following the reception, Polly headed for Campbelltown and then on to Gigha.